Welcome to H. C. Haynes Inc. 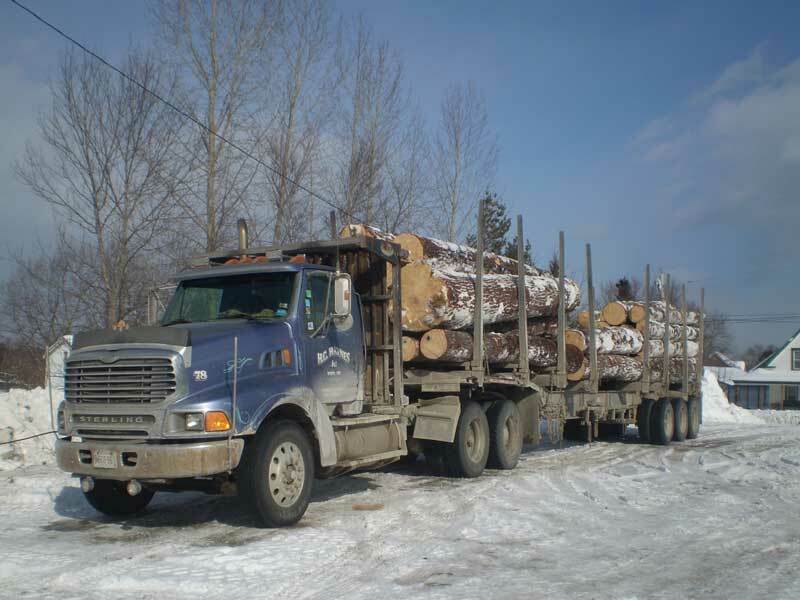 The Forest Stewardship Council® (FSC®) was created in 1993 to promote responsible forestry on a worldwide basis. FSC standards span economic, social, and environmental concerns, and those standards are now being applied in over 50 countries around the world. FSC certifies against 10 principles and 56 criteria that address legal issues, indigenous rights, labor rights, multiple benefits, and environmental impacts surrounding forest management. These rigorous principles and criteria apply to all FSC-certified forests throughout the world, including the different bio-geographic regions of the U.S. 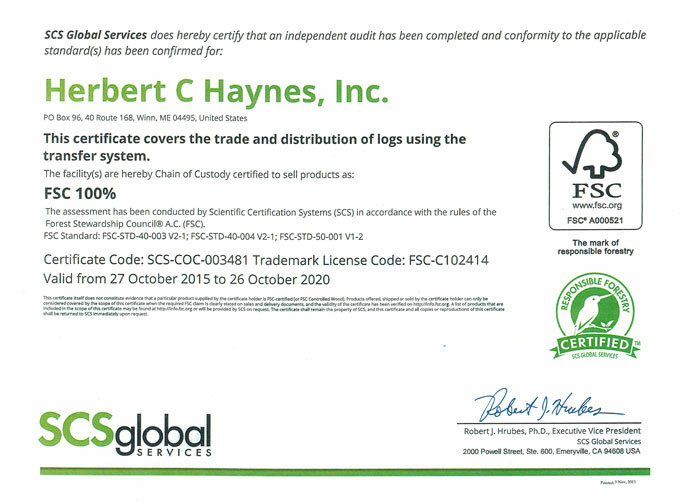 In 2010 Scientific Certification Systems audited H.C. Haynes, Inc.'s performance under the FSC standard. 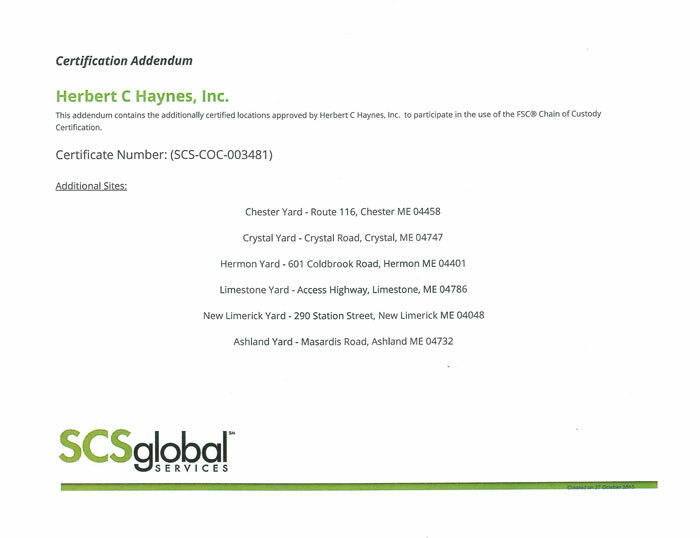 Following the audit, Scientific Certification Systems issued H.C. Haynes, Inc. a Chain-of-Custody Certificate based on FSC COC STD-04-004 (Certificate Number SCS-COC-003481). Products and species included in the scope of each certificate may be found at www.fsc-info.org. For more information, visit the FSC website. A critical part of H.C. Haynes, Inc.'s business model, formal certification by this organization guarantees that H.C. Haynes, Inc. and its customers have access to an objective evaluation of H.C. Haynes, Inc.'s sustainability efforts. To learn more and to review public summaries of our audits, CLICK HERE.